Need details on SpaceX’s Mars mission? Links, photos and more about Elon Musk’s plan to make humans a multiplanetary species. What the view of Mars might look like from inside the Interplanetary Transport System. Image via SpaceX. I cruised around West Texas for nearly a week – internet-less – in the magical deserts of Big Bend National Park. And (speaking of deserts) that’s why I missed Elon Musk’s September 27, 2016 announcement about SpaceX’s plan to make human life multi-planetary by building a self-sustaining, one-million-person civilization on Mars. Here’s a short synopsis, with a few links to great, long, detailed articles written this week by others, plus some photos and videos, including the two-hour video from SpaceX of Musk’s actual announcement at the 2016 International Astronautical Congress in Guadalajara, Mexico. Elon Musk is SpaceX’s Founder, CEO, and Lead Designer. His vision – announced in what Eric Berger at arstechnica.com called “the naked baring of his soul” – is to ferry 100 people at a time to Mars in a skyscraper-sized rocket. These aren’t free trips. No one is going to send you to Mars. But your ticket to Mars would be within reach, according to Musk’s plan, for less than US$200,000, or about the median cost of a house in the U.S.
… by far the biggest flying object ever. December, 2022: Maiden [Interplanetary Transport System] voyage to Mars. Carrying only cargo. This is the spaceship Elon wants to call Heart of Gold [a nod to the fictional spacecraft A Hitchhiker’s Guide to the Galaxy]. January, 2025: First people-carrying … voyage to Mars. If things go to plan, the Neil Armstrong of Mars will touch down about eight years from now. A dissection of the technical and financial feasibility of SpaceX’s plan, from Eric Berger at arstechnica.com. The video just below (nearly two hours) is the complete announcement by Elon Musk on September 27. The talk itself starts about 20 minutes in. Artist’s concept of SpaceX’s big rocket. Image via Wait But Why. 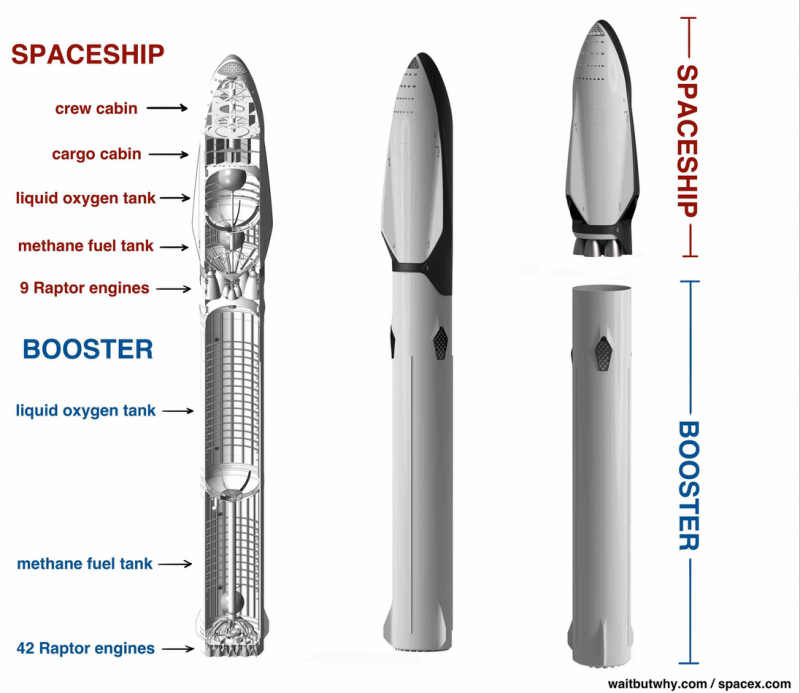 Musk said he likes the word “system” for his Interplanetary Transport System because it has 4 parts: a rocket and spaceship, shown here, plus a fueling tanker and propellant depots. Image via Wait But Why. Artist’s concept of SpaceX’s rocket, upright in the city of Boston. It’s as big as a skyscraper, by far the biggest rocket ever built. Image via Wait But Why. Artist’s concept of Space X Interplanetary Transport System at Cape Canaveral, ready for launch. Image via SpaceX. Lift off! One hundred Mars wayfarers would be aboard. Image via SpaceX. The rocket booster would detach and return to Earth, pick up a fuel tank (liquid oxygen and methane), and head back to Earth orbit, where the Mars ship would be waiting. Once carried to space by the booster, the fuel tank and original rocket would connect like 2 orcas holding hands” as the fuel is transferred. This happens again … and again … until the Mars craft has enough fuel to get to Mars in only about 3 months. Imagine the excitement aboard the ship as Mars looms ahead. Image via SpaceX. 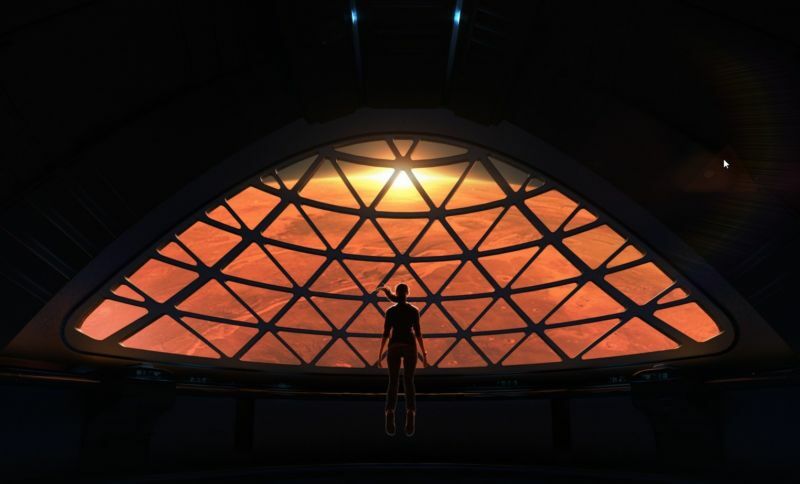 Artist’s concept of future Mars colonists facing their new world. Image via SpaceX. It’s not all dreams and artist’s concepts. 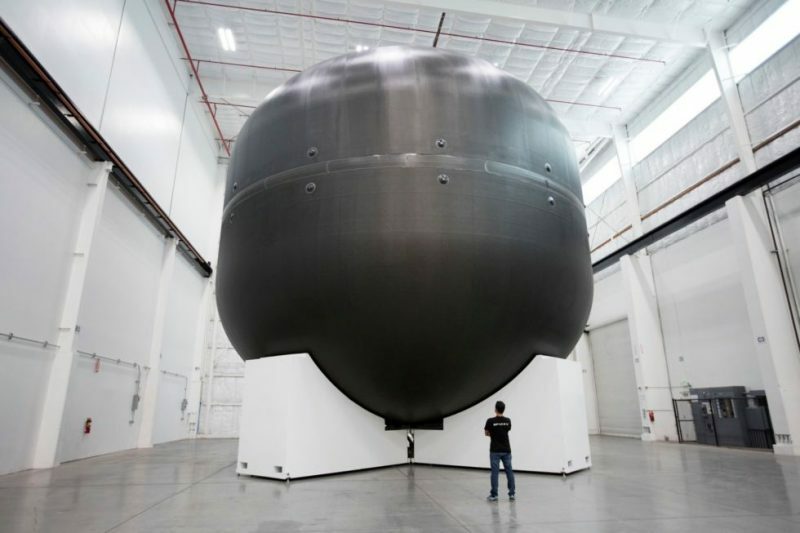 Here’s the “big” composite tank used to contain pressurized liquid oxygen that Musk revealed on September 27. Image via arstechnica.com. Bottom line: Elon Musk of SpaceX said on September 27, 2016 that he wants to make humans a multiplanetary species, beginning with a million people in a Mars colony by the end of this century.